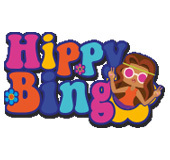 Hippy Bingo Review | Play the best bingo online! Hippy Bingo is the newest peace, loving and flower-power hugging online bingo site for 2016! Head to the strawberry fields, to find the happiest site in town, filled with caravans, colourful flowers and plenty of chances to win! At Hippy Bingo, you can pick up a huge welcome bonus, plus daily, weekly and monthly bonuses, cashback and peaceful jackpot treats. You can then get your peace and loving bingo fix while cruising through the hottest slots, casino, instant, mobile and jackpot tournaments! 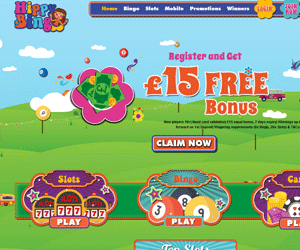 When you float onto Hippy Bingo's happy reels, you'll be rewarded with a huge £15 FREE no deposit bonus! You can then pick up a hip 350% first deposit welcome offer, which is one of the highest around! On your first 3 deposits, you can earn a huge 500% deposit bonus match, to help you on your flower-powered adventure. Hippy Bingo will then spoil your with rewarding offers, like the £20,000 Slots Tournament, and themed giveaways to win fabulous prizes and seasonal 20% Cashback offers.There are also plenty of Jackpot specials like the Daily Boost, £250 Weekly Wins, and the £500 Monthly Moolah plus the chance to play FREE bingo and more! You can also hang out in the chat rooms to play extra quizzes, games and snap up even more exciting prizes! Get ready to hop on the whistle-stop tour of London past Hippy Bingo's 16 awesome 30, 50 75, 80 and 90 Ball Bingo Rooms. Board the bus at Big Ben, and you can travel to Victoria, and even meet the Queen at Buckingham Palace! You can also feel the winning rush playing daily, mega and super jackpot bingo tournaments, as well as two exciting FREE bingo rooms. Then you can continue the tour to the slots lounge to play Big Ben, Treasures of Egypt, Lucky Clover. If you cruise over the casino lounge, you can play table games like Keno, Premier Roulette and Jacks or Better.. There are also scratch cards and fun-packed instant games, and multiple progressive jackpot games! You can also hang out with the other peace-loving hippy roomies in the chat rooms, to play even more games and have more chances to win!